OK... 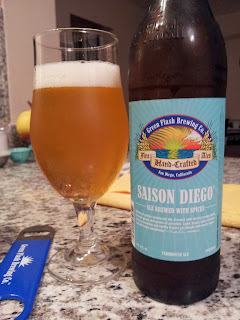 I'll admit it... we've been sufficiently neglectful of Green Flash. Sometimes I feel bad about that because they make really good beer, and I wouldn't want to see them fade away from view. No, not everything is gold, but mostly it is (for example, I use HHR as a gold standard for red IPA), and I want to make a concerted effort to give them due credit on this site. With Saison Diego the first thing you notice is the wonderful aromas that waft from the glass; this tells you a lot about the beer, quickly, and puts you in the mood to polish off a full 22. The taste is pretty wonderful too: classic Belgian yeast flavors complement the orange zest and ginger it was apparently brewed with. It's rather light bodied, and pretty light on the alcohol as you can see, but it's still very flavorful. I would probably amp the booze up to maybe 5.5% or 6.5%, and maybe give it a bit more body, but otherwise this a fine adult beverage. In other cities it'll perhaps be a less appropriate choice, given the seasons, but San Diego doesn't really have seasons, so whatever. Welcome to Saison Diego; beer runs the seasons in this town.